We visited the school ahead of time. 6 different classes, 5 different teachers. We walked the campus three times. He knew just where to go. He’s so big and at the same time, so very little. This year my son started middle school. He’s the oldest, making this our first middle school transition. Overwhelming for him… overwhelming for me. I went searching for advice. Going into new experiences with a plan always makes me feel so much more grounded. First stop was my sister. As a former middle school teacher, she is my go-to for all things tween. Next up, the school orientation. There the principle offered warnings about some of the pitfalls of 6th grade… I listened very carefully. Tweens are really starting to crave independence (and we are craving their independence too!). Most of my son’s teachers made it very clear that they want the kids reaching out to them with problems. They want the kids getting make-up work on their own and they want the kids to be responsible for their own gym clothes. YAY! I want all of that too. An independent middle schooler sounds like less work for me! The thing is, a lot of things change during the middle school transition and our 6th graders need to be taught how to be independent. Now a month into the school year it’s time to check in… to see what’s working and what is not. Ohh, so well said! Our big(ish) kids will be moving from teacher to teacher this year, coming in contact with many different teaching and personality styles. That is not always easy. How you can help: Run through the day on the way home from school. Ask about each specific class, what they did and what they were excited about. I try to make this fun by challenging myself to remember the order of his schedule and each teachers name. This is also a great time to sneak in little questions about how each teacher runs their classroom. Homework. Full disclosure, this is our first year in public school and we are just plain not used to homework. YIKES! There are a few things I’ve noticed so far this year. #1. My son has a hard time remembering what was assigned at the beginning of the day. (6 different bosses remember?) #2. Once it’s done, finding it among the other stuff in the backpack in order to turn it in… is hard. How you can help: The goal is that by the end of the year he will be able to manage the homework situation on his own. But first, he needs help putting a system in place. For us, a single folder has been working. I had him use a post-it note and write “to do” on one side of the folder and “turn in” on the other. That has been working wonders so far! Backpack. This backpack is heavy… and he only has one textbook to carry! You know what makes it heavier? Trash, extra papers and junk collected through the day. Learning how to keep a space like that organized is an important life skill! How you can help: Set up a “clean out day”. We decided on Friday. This feels like a great way to wrap up the week. The bonus is the backpack is ready when Monday rolls around. 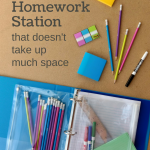 Have your middle schooler empty the backpack and only put back in what needs to be there. 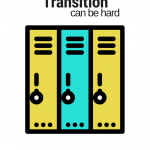 Share your middle school transition tips in the comments. How to Hug a Porcupine: Negotiating the Prickly Points of the Tween Years (affiliate link). 6th grade and navigating middle school. With a son. I’ve seen youtube videos of tween/teen girls who detail how they organize their backpacks/homework situation/ lockers at school. So yes, helping your new middle schooler put systems into place is key. This was required by my sons school. one place where they write down every day’s assignments, upcoming tests, quizzes and long term projects. Tests/quizzes were written down in the date they were to occur, a colored line was drawn from today’s date to the quiz/text date so the student knows in addition to today’s homework, they also have a test to study for. My son hates writing in his agenda book. Says it’s just a waste of time. That he can remember his homework. Ha. Well, most days he does, but sometimes he does not. Agenda book is also a great place to collect telephone numbers or email address of students in your class so that is you do forget an assignment, you have someone to call to clarify what it was or when it’s due. Make sure your child has emails for all of their teachers. Since the child will now be becoming responsible to managing their communications with teachers and with their own homework, they should have a way to communicate with their teachers. They can cc you if you like. Asking for make-up homework, telling teachers when/if the student will be out of town becomes the child’s responsibility. Going over the day or important things to remember on the way to school. 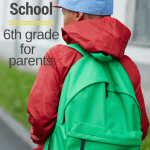 Recapping the day on the way home from school are both nice ways to let your child know you are interested and paying attention to their day at school, while still giving them the space to navigate middle school independently.